Irrigation is usally essential after bedding in a new garden. It is the first years of any plants life that are cruciual to it taking hold. Later with their roots deeper they can survive longer periods without rain. At it simplest Irrigation means hand watering. Sadly most of us do not have the time or inclination to do it. Anyone can go to the garden centre and pick up an irrigation kit which might cost a couple of hundred pounds. You might find it to be a absorbing pastime: installing an irrigation system is not much different to setting up a miniature railway set, complete with stations, junctions and signal boxes. So, great fun. 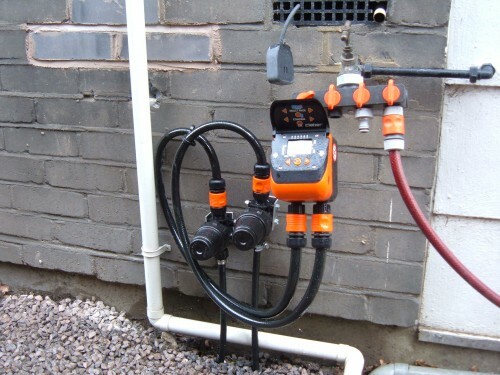 Intelligently installed, it should perform the miracle of watering your plants for many years to come, saving much labour. Should it rain, a rainsensor can shut it all down – so nature still weighs in with what she has to offer. Larger gardens will need many computer-controlled circuits, running in a sequence to make full use of the water pressure available. Then there are ecological systems like rain-harvesting, meaning you trap and keep rainwater which can then be pumped back in the garden later. This might well rack up your green credentials especially if it puts you back in the hand-watering bracket when the water runs out in the summer. You will need a whopping underground tank and a pump for it to work and with an irrigation box that is a major project. In terms of reliability, a professional irrigation system using mains water is still the best bet to preserve any investment in planting and make possible those gorgeous summer bedding displays. 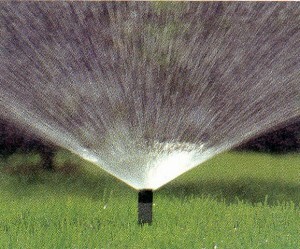 The main problem with getting in irrigation companies is that many of them have no idea what they are watering. By rote they often water everything. This is often detrimental and expensive. Here at Greenspirit gardens we make sure our systems are horticulturally intelligent. 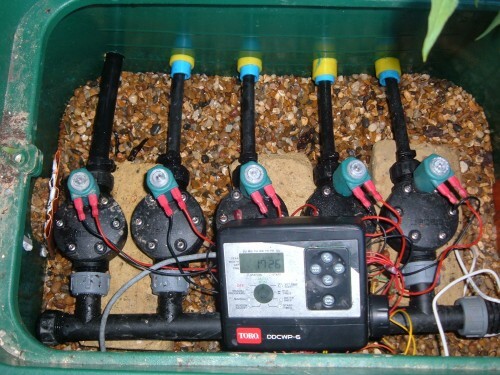 Here is a single-solenoid water computer for a smaller garden . What you see at the tap is only a fraction of the (often) underground network of pipes sprinklers and drippers to serve all the plants. Gerry Feeny undertakes irrigation for Green Spirit Gardens and he can be reached through the contact page. Couldn’t resist posting this American racoon video on the delights of irrigation!